Preheat oven to 350°F. Line 9×13-inch baking dish with parchment paper and lightly grease with non-stick cooking spray. In a large microwavable bowl, melt the butter and 1 cup chocolate chips in 30 seconds intervals until completely melted, about 2 minutes. Stir in the sugar then the eggs, one at a time, until well combined. Stir in the vanilla. Add the flour and salt and stir until just combined. Stir in 1 cup caramel bits, 1 cup chocolate chips, and 1/2 cup chopped pecans. Spread batter evenly into prepared baking dish. Bake for 45-50 minutes until a toothpick inserted in the center comes out clean. 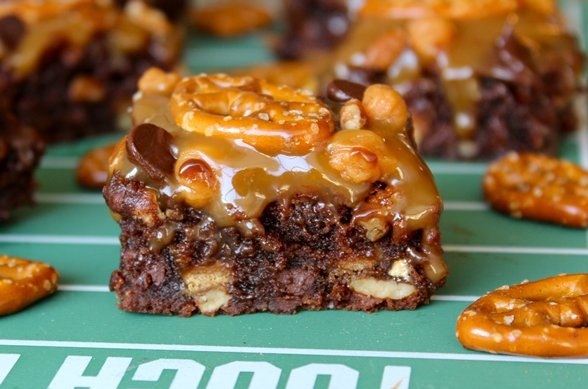 Place on a wire rack and spread caramel sauce evenly over hot brownies. Place pretzels evenly over caramel and sprinkle with remaining 1/4 cups of chocolate chips, caramel bits and chopped pecans. Place brownies in the refrigerator for at least an hour and the caramel will set. Otherwise, serve warm or at room temperature for a gooey caramel topping. Lift brownies out of dish with parchment paper. Cut into squares.